Tuesday morning I awoke late and had few plans other than pizza dinner at Leonardo and Franca's at 6:00pm. I decided to take a ride to Bompietro and Locati to take more photographs. Then I went to Verdi and enjoyed the warm spring day, stopping around noontime to have lunch in my car just outside Gangi. I brought along some salami, cheese, bread, fruit and a few cokes to drink. I drove through Gangi and made the drive along SS120 past Santa Caterina LoDico and up into the Madonie mountains to Piano Battaglia. The panorama was beautiful as I climbed in altitude. There was still about a foot of snow on the ground and there were two vista points where I could see the sea and the Aeolian islands as well as a larger city that was most likely Cefalu. Returning back to Petralia Soprana, I had some time to clean up, take a short nap and then head over to Santa Caterina LoDico for a wonderful home cooked pizza meal by Franca. We watched the news showing the new Pope giving a blessing at the Vatican and then I headed home for bed. Wednesday was my day to return to Marianopoli so I rose early, packed another lunch and was on the road at 8:30am. I took SS120 towards Alimena, hoping the road was finally open. With luck it was just being finished and I reached Resuttano, making good time as I headed towards Marianopoli. As I dropped in altitude from Petralia, it grew very warm and soon I had shed my jacket and hat as I entered Marianopoli and headed for the Municipo to look up Michela Vullo again. With luck she was at work and after some introductions she remembered me and told me others at work told her we were there last week. I handed her the CD with my Aunt Angelina's photos from 1955 of Marianopoli and the relatives and she scrolled through the photographs. She recognized many photos including her fathers and soon everyone in the office was looking at the photos and recognizing people they either knew or were related to. Soon Michela was calling people on the phone, as she was quite excited about the many photos I had shown her. Many people in the office asked me if my Aunt Angelina was the Angelina LoDico who has a cappella named after her in Tinchi, but I tried to explain that was another relative of mine and Michela's. I was then shown a brochure on Angelina LoDico, the teacher saint of Marianopoli and what appeared to be a celebration of her life by the people of Marianopoli. After much discussion I let Michela get back to work, told her I was staying in Petralia Soprana and would come back again before I left on the 29th. I headed over to Rosario and Rose Casucci home and once again found no one answering my knock at #15. It was around noon and I knew everyone was home eating lunch and relaxing but I finally decided to ring the buzzer on #17 just to ask if the Casucci's were out of town. To my surprise Rose appeared on the balcony. It turned out #17 was actually their entrance and the previous visit they were home and just missed us. I gave Rosario a gift of a bottle of Johnny Walker whiskey and I asked Rose if she remembered what she told us four years ago what she missed most of the USA. When she answered pancakes, I produced the pancake mix and sloppy joe mix that Elaine had brought from Boston and we all laughed. Rose told me of a couple that came from Rochester last year, the Valenti's and I said, Barbara Valenti? I know her! We have exchanged emails and way back, we are related. Rose then told me there was this girl living in Switzerland whose grandfather lived close by that saw my web pages and commented on the family house at Via Margarita. I told Rose I knew her as well as we exchanged emails and she told me whenever I return, just ask for my grandfather to show you the inside of the house. Rose then called the man, Mr. Lombardo, and after a few minutes we walked to Via Margarita #28 and I got to see the inside of the now empty and abandoned house..
Four years ago, my brother and I found the same #28 and took a photo standing beside the small door that appeared to lead into a cellar room. It was not what appeared to be a great place to live, especially for my grandmother and eight children. To my surprise Mr. Lombardo opened the adjacent doors and told me the entire house, all three levels was the LoDico family home. He said he remembered the pharmacy / barbershop of Ignazio's to be located here. Inside the large house looked totally abandoned since my family left in 1906, but a calendar dated 1995 probably meant it was only recently abandoned. Mr. Lombardo said if I wanted to buy it I could for 30,000 Euros. Obviously it needed everything but it was very large and had great potential. I said my thanks for showing me the house and as we talked outside a woman approached and asked if I was the LoDico from America. With Rose translating I learned her son was working with the town committee to being the process of making Angelina LoDico, the teacher saint of Marianopoli a recognized saint through the Catholic church. After much excited discussion on my part, I agreed to come back on Saturday to meet her son and the town committee working on the beatification of Angelina LoDico. The local priest and church was involved and the only hang-up was finding her bones so that the Vatican could officially get involved. They were very much interested in my genealogy work on Angelina's ancestry. Needless to say I was very excited by this and as Rosario and Rosa showed me around, including two of there plots of farmland, a summer home near Tudia and the Sanctuary at Belice, I couldn't help but wonder about how exciting it would be to help, even in a small way on the effort to make Angelina LoDico a saint. Belice was a beautiful sanctuary, perched high on a hill, between Tudia and Marianopoli. I soon said my goodbyes for the day and drove back to Petralia Soprana with some great news to tell Mimma and Vittorio as I caught a late dinner at their house. Vittorio asked if he could join me for the drive on Saturday and I agreed. The only sad news of the day was learning that Lucia's father, Santo had passed away earlier that day. After his 91st birthday, which Elaine attended, he had been feeling ill and steadily got worse. The funeral was scheduled for tomorrow at 4:00pm at S. Salvatore Church in town. Thursday dawned and I was still thinking of the previous day's events. I had a pastry at the piazza, then a cappucinno and decided to find out if Pietro Albanese was in his shop. I had met him after the band concert and Elaine had let him download the band music she had taped. Pietro had an internet connection with DSL and I was hoping to get on line and clean up what would be a ton of emails, both personal and business, that was waiting for me these past 20 days. After about an hour of cleaning up all my emails, I thanked Pietro and headed back to my apartment to eat some lunch, rest, and prepare for the funeral at 4:00pm for Lucia's father Santo. The funeral for Santo was attended by about 300 people. Many stood in the back of the church: San Salvatore, during the ceremony. After don Calogero LaPlaca gave his sermon I had a chance to tell him about Angelina LoDico and we discussed going to Blufi tomorrow morning at 10:30am. The funeral procession then walked through town and down to the cemetery about a 1/2 mile outside of town. I had the chance to walk the way with Lucia and Pietro, Mimma and Vittorio, and Giuseppe and Maria Grazia. Most of the LoDicos were there and I had a chance to meet many more relatives, including Lucia's side of the family and her other son who lives in Rome. It was just one of those family events that one gets to see everyone, just not a happy event. I stayed with Pietro and Lucia and her mother until most of the guests had left then said my goodbyes and walked back to my apartment. It was 9:00pm and I was tired from the days activities. In the quiet of my apartment I has a cream lemon chella drink and stood on the kitchen balcony with a cigar to reflect on the day's events. Thinking of Santo, his 91 years, how happy he seemed just days before to celebrate his birthday with us, eating his torta, dipped in his wine and smiling; it just seemed like life comes and goes in this quiet village. I listened in the stillness only interrupted by the chiming of the church bells for 9 o'clock. I wondered if on another night, my great grandfather or his great grandfather did the same thing; reflect upon the still night, watching the clouds encircle this town yet keep the sky above clear and crisp, the half moon and stars shining down bright. It was wonderful to be alive. I could almost feel the quiet sameness envelop me as it probably did my ancestors. Time really didn't seem important here. Things weren't measured by appointments or schedules. High up in these Sicilian mountains the world seemed so far off and unimportant. I soaked in every moment I could, finished my drink and cigar and called it a night. Friday morning started at 8:30am as for the first time since coming to Sicily I actually set an alarm to wake me up. I really didn't want to oversleep and rush to meet with don Calogero for our morning drive to Blufi. I arrived at his house on time and after some coffee we headed straight for Blufi. After checking at the church, we found Padre Vacca at his house and we all headed over to the quartiere Malpasso as Padre Vacca began to talk about the origins of the LoDicos in Malpasso and don Calogero translated to me. Soon we were heading towards the Sanctuary of the Madonna of the Oils and I lead Padre Vacca and don Calogero LaPlaca into the small cemetery on the sacred ground of this ancient sanctuary built by the Templar Knights of Malta at the time of the Crusades. Back in Padre Vacca's residence we were joined by a third, younger priest and after some discussion, I was asked if I would like to view the bridge that was built during Roman times. Of course I agreed. Soon we headed toward the Roman arch bridge that crossed the river Imera on the outskirts of Blufi. Padre Vacca told me the story of the first LoDicos in the area, a family of campiere, hired by the Marchese Pottino to protect the most dangerous stretch of road that led from Catania to Palermo during the 1700's. Suddenly I had pushed back my knowledge of my first ancestors by almost 100 years and I began to understand the meaning of the land known as Malpasso and the ties to the first nobility of Sicily. Later, back in Padre Vacca's office he looked up some old records but since Blufi was always a part of Petralia Soprana, I had more earlier records than his on the matters of births and deaths. After saying our goodbyes and giving thanks to Padre Vacca for his help, I joined don LaPlaca for lunch at his house as we discussed the days events and more of the early years of nobility and history in early Sicily. After lunch I returned to my apartment, but not after trying the door of my friend Leonardo Cancillari. With still no answer I walked back to my apartment, half wondering if he was all right since he was very overdue for his return to Petralia Soprana. After just ten minutes of sitting down and writing in my journal, there was a knock on my door and there was Leonardo. He had just returned from Palermo, via Germany and he apologized for being so late in returning, as promised. Soon we were getting to know each other and I was delighted to see that he spoke excellent English and we shared many things in common including our views on politics and our interest in history, art, and culture. We were soon joined in the piazza by one of his artist friends: Iganzio Albanese, a painter and we shared a conversation, a ride to Madonnuzza, pizza, and beers in Petralia Soprana. It was a very interesting afternoon and night as I received a different perspective on life in Petralia Soprana from these two new residents. Saturday began early as well as I headed into the piazza early for some pastry and a coffee before meeting up with Leonardo at a little after noon time. Last night when Leonardo heard about my trip to Marianopoli, he asked to join Vittorio and myself and I agreed. By 1:00pm we tried Vittorio's door a few times but no one was home. After another try at 1:30pm we were pressed for time so we headed out of town. I spotted Mimma at the flour mill and pulled over to ask about Vittorio. It turned out Vittorio was called in to work and couldn't go so Leonardo and I headed off to Marianopoli. We arrived a half hour early and had a chance to walk around some before meeting with Rosario and Rose Casucci. Soon I was introduced to Arcangelo Vullo, a young man, and his mother, who I met last time while viewing my grandfathers last residence in Marianopoli. Arcangelo shared with me his information and how upon learning Angelina's story was moved enough to begin this project to help make her a saint. He showed me his work and the work by many residents and clergy to move this town project along. He had interviewed many LoDico and Immordino relatives and had some extensive interviews and a great collection of photos of Angelina and her family, relatives and school children. I shared the genealogy information with Arcangelo and agreed upon our assessment of the origins of the two LoDico families that preceded mine in the town. Arcangelo was told the first LoDicos there came from Montedoro, a small town just south, and close to Caltanissetta. He also mentioned the local church had set up a side altar and stained glass window in honor of Angelina. After sharing some information on residences of Giuseppe and Angelina, Angelina's parents, I learned that my grandfather must have sold his residence at Via Margarita #28 to Giuseppe LoDico because that is the location where Angelina died in 1932. We said our goodbyes and agreed to stay in touch and then headed south from Marianopoli to the ancient ruins of Mussomeli and the churches. As dusk began to set in and the full moon rose we then headed south to the town of Sutera before heading back to Petralia. It was a long day but another great one, full of memories I will always have. Late Sunday morning I met up with Leonardo and we again decided to take another drive in what was now a stretch of warm weather. We headed north on SS286 to Castelbuono after passing through Geraci Siculo. There was a street festival in Castelbuono and after a short walk through the town we headed to Isnello and then back through Collesano before completing the loop home through the mountains of the Madonie and Piano Battaglia. After stopping for a meal in Madonnuzza we called it a night. After our meal I had some car trouble with my rental car and without being able to restart it we finally called the rental company who came and picked it up. Leonardo had to return to Palermo the next day so I agreed to accompany him to the airport where I could pick up a new car for the remaining days of my vacation. After a long night I slept in on Monday before I went looking for Leonardo. I managed to have Leonardo translate for me as I met up with Giuseppe LoDico in the piazza and invited all the LoDico's to a dinner at Cerasella on Thursday. I asked Giuseppe to tell Leonardo and Franca and Pietro and Lucia. I then saw Rosario and was able to invite his family. When don LaPlaca walked by I was able to invite him and I asked him to contact his nephew at Cerasella and reserve a table for about 20 to 22. Leonardo and I then had a late lunch and finally left Petralia Soprana around 1:30pm. We had earlier agreed to stop at the Municipo in Termini Imerese with the hope of being able to find my mother's grandfather's birth record but April 25th is a national holiday in Italy and all the town halls were closed. I finally picked up my new rental car and after saying my goodbyes to Leonardo I headed back to Petralia. Arriving at the piazza at about 8:30pm I saw Mimma and Gianluca so I parked my car and walked back to greet them. By inviting Vittorio and Mimma I had almost completed my invite list and I enjoyed drinks and the conversation until around 11:00pm when I headed back to my apartment and called it a day. I had hoped to see the archives after breakfast today but Vittorio, don LaPlaca's assistant was busy and asked me to return tomorrow morning. I walked over to the town library and after looking through the books and rooms had a brief conversation with Rosario Ferrara the librarian and he gave me two books on the history of Petralia Soprana. I was invited to dinner at Rosario's house so I had some time to go back to my apartment and catch up on some writing and cleaning up. I then decided to return to Termini Imerese and wrap up the last detail left I wanted to accomplish on this trip; try to find my mother's Mormino side of the family. I easily retraced the route to the town's archive center and soon I was in the room with an assistant looking up the records. It appears that my guess that Matteo Mormino and my great grandfather Giuseppe Mormino were brothers turned out to be wrong. Matteo's father was Antonio as expected but Giuseppe's was Giuseppe. I now guess that they were cousins and perhaps Antonio and Giuseppe were the brothers. I am even more sure now that Termini Imerese is my mother's ancestral home since there were many Morminos in the book and I even saw a Sansone which is my grandmother's name. I have the confidence now to begin searching all the records here by using the family history center's microfilm library when I return home. Since most of the shops in Termini Imerese were closed I headed back to Petralia, stopping in Collesano, then went through Blufi and bought some gifts. I made a last stop in Bompietro and took photos at Via LoDico. I spoke with an old woman there but she had no recollections of any LoDico's still living on the street that bears our name. I found #10, my great grandfather's house and birthplace of my grandfather Ignazio. and then headed out toMadonnuzza for a bit of food shopping. I arrived back in Petralia Soprana at 6:00pm and had two hours to rest up before dinner at Domenico and Grazella LoDico's home. Dinner was another great meal. Grazella laid out an antipasto dish of fresh olives and marinated artichokes that she preserved herself. The bread she made as well in her home. We then has an asparagus and rice dish followed by a roast beef grilled in a red sauce that was excellent. There was fresh cheese and fruit and a mixed green salad. Of course Domenico had his vino locali from Santa Caterina LoDico and dessert was cannolies and chocolates. I again mentioned my offer to have Gianluca come to California and work for me and I said I would talk more about this on Thursday when I had Santina or Leonardo Cancillari there to interpret my words. After a long meal and much talk Grazella gave me some Italian coffee to take back to America. Back in the piazza I met up with Mimma, Vittorio and little Liliana for a nightcap of Muscato. With Maria Grazia at home with a fever, I gave Liliana a gift of coloring pens I had bought for her in Blufi. I said my goodnights and headed off to bed. I wanted to rest up so I could spend tomorrow morning and part of the afternoon in the archives. I wanted to get an early start today at the church archives as this might be my only opportunity to have a look before I head home on Friday morning. Tonight I am to have dinner at Leonardo and Franca's in Santa Caterina LoDico. I had to wait until 10:00am before Vittorio showed up and opened the archives for me. I poured over the records until noon when he came for me and told me to return after lunch at 3:00pm to continue. Today was perhaps the only day I regretted the slow pace of life and work in this small Sicilian town. Everyone is up early buying bread and the days food before 8:00am. Work starts for most at either 9:00am or later and lunch is about two or three hours long. Most shops reopen at 4:00pm until maybe 7:00pm when everyone goes home for their dinners which begin at 8:00pm or even 9:00pm. By 6:00pm I had managed to look up about as much information as I could without overstaying my welcome. I found Vittorio and thanked him and headed home to freshen up before driving down to Santa Caterina LoDico for dinner. I gave Franca my American coffee canister as a gift and I also brought a bottle of grappa. Pietro and Leonardo invited me to milk a cow and we headed up to the top of the hill and into a pasture where grazed their twelve cows. Soon I was milking my first cow and the taste of warm milk wasn't too bad. It was a fun experience. Dinner was almost completely a product of the farm. Fresh olives and cheese and grilled meats followed by artichoke fritters and a hot bowl of chick pea soup that was excellent. Leonardo brought out a bottle of his homemade fennel liquor that was just excellent. We sampled the grappa and after coffee I said my goodbyes, especially to Lucia who would not be able to be at Thursday's dinner. With everything now accomplished on this vacation I let myself sleep late into the morning, not rising until almost 11:00am. Leonardo Cancillari came by around noon and after catching a bite to eat with him I begged off for the rest of the afternoon because I needed to pack and get ready for my last dinner with my new family and friends at 8:00pm. After checking my departing flight schedule, I decided to leave at 3:00am for my 6:30am flight out of Palermo. That meant I had better catch another long nap before 8:00pm dinner and I did just that. 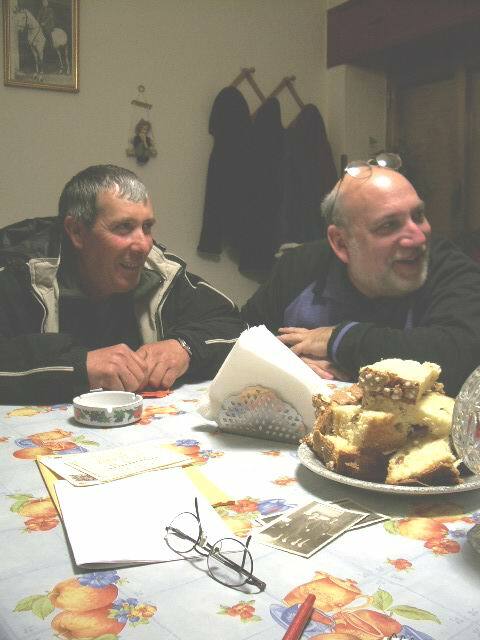 By 7:30pm I headed over to Cerasella and talked some to Gacomo, the cook and nephew of don Calogero LaPlaca. Everything was in place and by 8:15pm everyone showed up as planned. I had twenty two relatives and guests and had a wonderful meal that lasted till almost midnight. After a toast of champagne we all said our goodnights and goodbyes. This vacation was fast coming to an end and after driving back to my apartment and finishing packing, I said my good bye to Petralia Soprana and began my return home. It was about 12:45am when I left Petralia Soprana. I drove the SS120 route first through Petralia Sottana, in the quiet of the night and on through Castellana Sicula, deep in thought, most of my heart and soul now still in that small village in the Madonie mountains. A brown fox darted across the road along the stretch of road before the TreMonzelli exit on the autostrada. It was probably here at the exit on the highway that I felt myself leaving for the first time. Ahead was Termini Imerese and then Palermo as the pace of life now seemed to quicken although the road was nearly deserted at 2:00am. By 3:30am I had checked my rental car and proceeded to get my bag checked. I still had a few hours before my flight left, so I had a light breakfast and got caught up on some writing. By 6:00am I was boarded on my Alitalia flight to Milan. The plane left right on time and at 6:20am it's wheels left the ground and I had left Sicily. Looking back on this month I had come hoping in some small way to find something to take back with me. Family, a record or two, someone's recollections of an ancestor or perhaps just a photograph of a family home or town. I didn't realize instead of taking something back for myself I would be leaving so much of my heart and soul in Petralia Soprana and Santa Caterina LoDico.